The Ufford Crown epitomises what it is to be a successful country pub. What more do you need in an interior than sumptuous blue hues, antiqued brass accessories to reflect the period building and dark wood for a cosy feel? Well, delicious food is another thing, and they’ve got that covered too. Located in nearby Ufford in Suffolk and designed by the excellent Jojo Humes Brown, we knew we had to delve a little deeper. 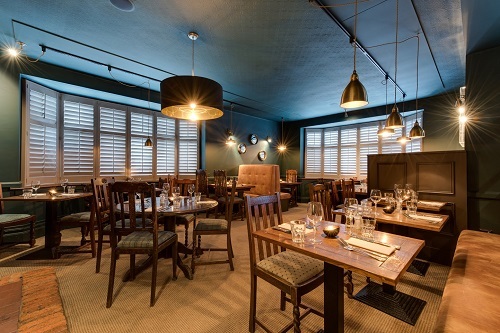 Max and Polly Durrant reopened the doors of the Ufford Crown in April 2011 with accomplished chefs Will Hardiman and James Wilding. With a focus on seasonal produce from local suppliers it has quickly become a go-to gem in the community. 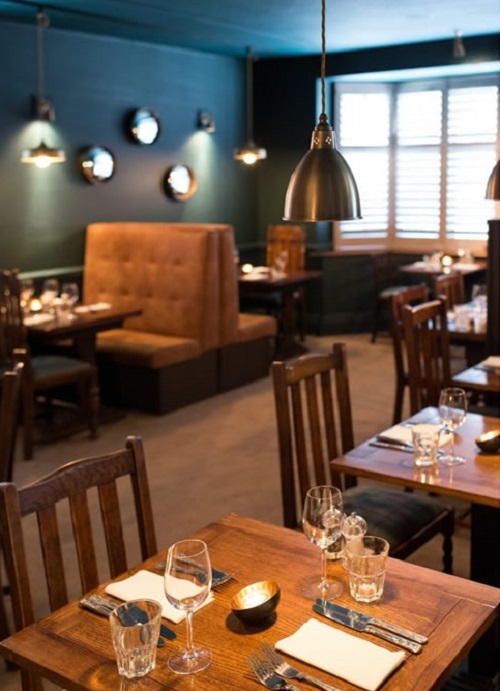 The Ufford Crown offers a spacious restaurant full to the brim with all your favourite Jim Lawrence lights, a snug bar area and a stylish lounge which is perfect for private parties. We love the dramatic feel of the décor. 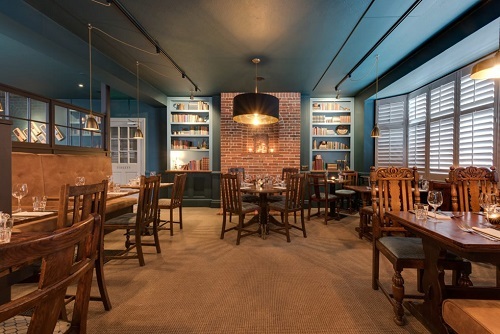 Hints of a New York Industrial look are filtered throughout in the exposed brick, painted panelling and quilted leather booths. The layered pendant lighting creates intimate pools and pockets of light for diners and drinkers alike. Jojo’s designs always exude a thoughtful but understated glamour, and she’s a dab hand at cleverly lit spaces. Our most popular pendant for its versatility and handy size, the Barbican is a perfect fit for a two person setting. They enhance the space rather than impose on it – a key balance in lighting. 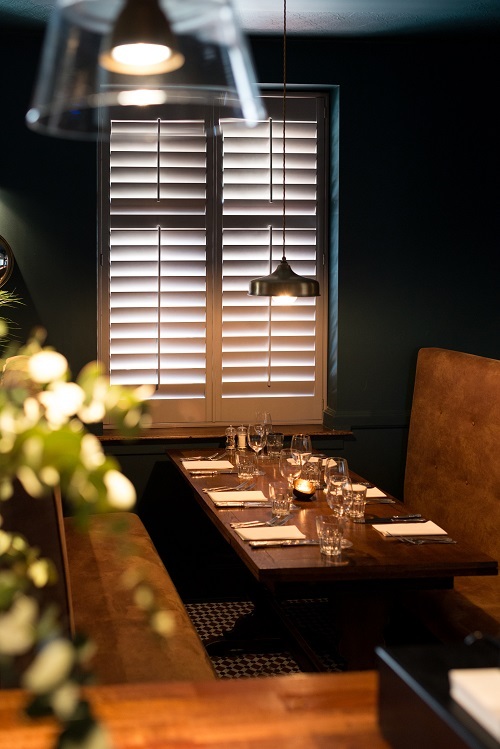 Homely touches like a wool carpet, bookshelves and decorative convex mirrors make the space feel warm despite its size, with the window shutters adding to the soft light for that sought after cosy modern country feel. A delightful spot to tuck into a hot pie or roast on a Sunday, or a lighter lunch of fresh sandwiches including Norfolk cheddar or Ketley steak. Our low hanging Exeter Pendants light up each booth – celebrating the high ceiling with a longer cable but making the seating feel private with a low glow. The Glass topped Lovell’s line the bar, the outer glass shade mirroring the shape of the Exeter but allowing the antiqued brass inner to breathe without looking clunky in a row or taking over the space. Can you see the detailed tiling underneath the table? The Ufford is full of beautiful visual surprises like this. Fancy a visit to see for yourself? Make a reservation here. To find out more about Jojo and her extensive portfolio, take a look at her website and follow her on Instagram.